Baseball fans, rejoice! Just in time for opening day, DKNY is launching a new ongoing women’s athleisure partnership with Major League Baseball. 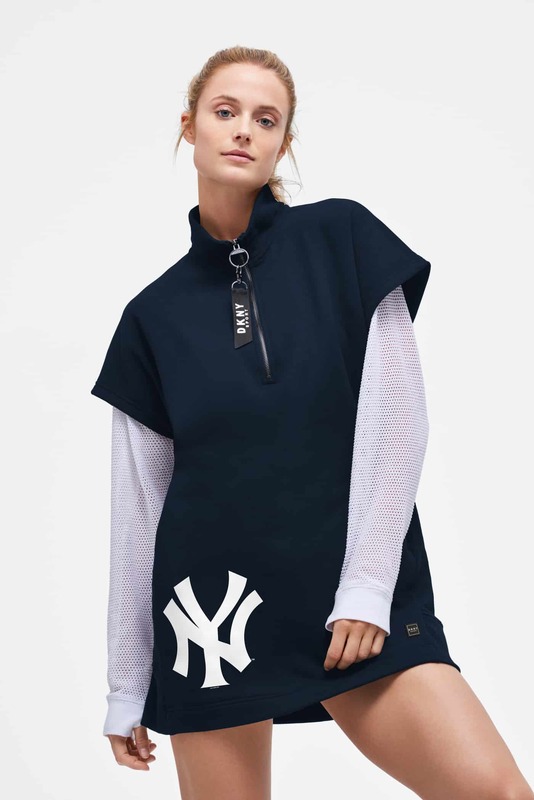 The sport-inspired collection brings DKNY’s signature city-ready sport styles to ballparks across the country, creating the perfect game day uniform for all 30 MLB teams and filling a hole in the market for fashionable women’s fan apparel. The collection includes DKNY sport favorites like the sneaker dress, coach’s jacket, and cropped hoodie, cobranded with the MLB team icon of the wearer’s choice. To bring the collaboration to life, DKNY will host a large-scale VIP launch event in partnership with MLB on opening day 2019. And beginning March 28, DKNY x MLB will be available to fans on DKNY.com, MLBshop.com, and Fanatics.com, as well as at Macy’s and select ballparks throughout the US. Prices will range from $40 to $70 for tops, $60 to $80 for fleece and bottoms, and $80 to $160 for outerwear.